Blackcurrants are an ideal fruit for the British climate, especially colder areas. They thrive on a hard winter followed by a warm and sunny spring / summer. The health benefits of this small fruit are well known and the vitamin C content is one of the highest of all fruits. They also have significant anti-inflammation properties which are believed to have health benefits. Amongst the most researched is the ability of blackcurrants to help in the treatment of asthma. The plants are extremely easy to grow and given a small amount of care will be productive for 20 years. Blackcurrants will tolerate many conditions which are not ideal, this makes them well suited to difficult parts of a garden. The key is to give them as much chance as possible and they will reward you with a regular and delicious crop. Blackcurrants are self fertile and will produce a good crop even from a single plant. However, note that blackcurrant plants produce much higher crops if insects have access to the plants, so don't net your plants before the fruit has set. Blackcurrants are tolerant of most positions in the average garden but of course they grow best in their ideal position. Full sun is best however some shade is well-tolerated. As far as the soil conditions go, well drained soil which retains moisture is the ideal. If the soil is waterlogged blackcurrants will suffer badly but they certainly like a constant source of moisture. See the paragraph entitled "when and how to grow" below for how to ensure the conditions are correct at the time of planting. The soil acidity is not crucial but blackcurrants prefer a soil which is slight acidic (a pH of 6 to 6.5 is ideal). If you are planning to plant blackcurrants in a frost-pocket then this is one the few fruits which can stand those conditions. The key with a frost-pocket is to choose the correct variety of blackcurrant. See the links at the end of this page to help in selecting the correct variety for your garden. Aside from selecting the correct variety of blackcurrant for your garden (click here to go to our page all about the different varieties of blackcurrant), blackcurrant bushes are sold in two forms - bare-rooted and pot grown. 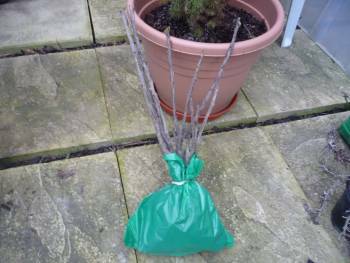 The picture below shows a pack of three bare rooted blackcurrant bushes. Inside the bag is the root system surrounded by a small amount of soil to keep them moist. This form is almost always the cheapest way to buy blackcurrant bushes and once planted they will grow well. The reason they are cheaper compared to other forms is that they are light weight and therefore transport costs are low. They can often be half the price of a potted plant and they are sold in a wide choice of varieties. The disadvantage of bare-rooted plants is that they can only be bought from early winter to late March. The other form of commonly available blackcurrant bush is the potted variety, see the picture below. The one you see there is probably a two year old plant. The advantage of this plant is that it is available all year round. The problem it has is that it's much more expensive compared to the bare-rooted plant. Our recommendation would be to go for the bare-rooted plants, they are cheaper and will grow just as well. Both types of plant are available online and can also be bought at garden centres and diy stores. Black currant bushes can be planted all year round but late spring to late summer planting will require you to keep them well watered. By far the best time to plant is October to late March when the ground is moist. Avoid times when the soil is waterlogged or frozen. With only one exception, planting is as for any other fruit bush. Dig the area where the bush will be planted until it is reasonably crumbly. Add a good handful of blood, fish and bone to the planting area and work it into the soil. Scientific experiments in the last five years have strongly indicated that incorporating peat or other additives (aside from fertilisers) into the planting hole does more damage than good. One study which is readable about this subject can be found here. It encourages waterlogging around the new root area especially in heavy soils. The best assistance you can give your blackcurrant bush is to mulch around it on the surface. Dig a hole about twice as wide as the root ball and 5cm / 2in deeper. Place the root ball in the hole so that it is 5cm / 2in below its previous level in the soil. Fill in with soil and gently firm down with your boot. Water well if the soil is dry. The principle behind planting deeper than normal is that it encourages the bush to grow multiple stems form just below the surface which in turn will result in higher crops and a more stable plant as far as wind damage is concerned. Now comes the hard part, prune severely! Cut all stems (yours may only have one stem) to about 10cm / 4in high. This severe pruning combined with planting lower in the soil, will encourage your blackcurrant bush to put out new shoots from below and above the soil level. Our top tip for fruits such as blackcurrants is to mulch them well when they are planted. For a top quality mulch which will retain moisture and prevent weeds lay newspaper (six or more pages thick) around the bush but not quite touching the main stem. Then spread wood chip over the paper several centimetres deep. This creates the ideal environment for the roots of blackcurrants, moist and warm. Click the picture on the below to enlarge it and see exactly what we mean. 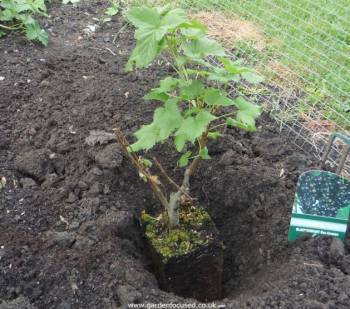 Below is our video showing how to plant a blackcurrant bush. In the video we have a bare rooted blackcurrant bush. Apologies for the background noise, the wind was blowing in the wrong direction and clearly, the camera microphone was not best set up! Note that after planting, the stem(s) should be hard pruned to about 10cm / 4in high to encourage new healthy stems to form. As noted earlier in this article, the advice we give in the video to add spent compost at planting time is probably best avoided. Blackcurrant bushes grow very well in containers although their need for a constant supply of water may prove a problem for some. Choose a pot with a diameter of 50cm or more and fill the bottom with stones or broken pots to allow drainage. The soil ideally should be half multi-purpose compost and half John Innes 3 but if the the pot is heavy all multi-purpose will be fine. Plant them and care for them as if they were in the open ground although more watering and more frequent feeding will help them along. QUESTION: Hi, I just came across your site, and was wondering what you know about growing blackcurrant bushes from their branches. 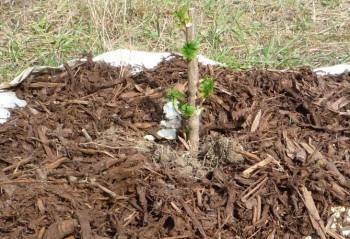 I seem to recall this can be done, if you put the trailing branch into the soil with the tip sticking out. However, I would like to know if it is feasible if the branch is cut off. 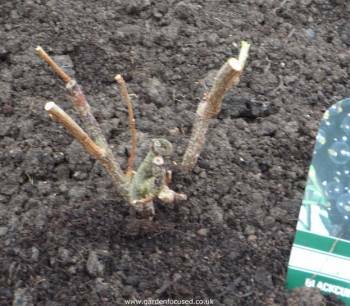 ANSWER: Yes, see our page here about propagating blackcurrant bushes with step by step instructions. QUESTION: Have just found your website and have some new blackcurrants planted 1 month ago. Can / should I still chop them down to 4 inches although they are beginning to green up along the branches? Thank you! ANSWER: Yes, it's fine to cut them back now. In this dry weather water them well and then mulch around them to conserve water. QUESTION: We have a wood burning stove and have been told that the ash is good for putting round soft fruit bushes, is this correct? ANSWER: Wood ash is generally quite alkaline and can easily reduce the acidity of the soil where it is added. Fruit bushes prefer a slightly acidic soil so adding wood ash is not normally beneficial to them and can harm them depending on how much ash is added. QUESTION: I hope to grow 3 different bare rooted plants, which do you recommend? Ben Sarek - good all-rounder and also withstands a frost better than most other varieties - an insurance policy!